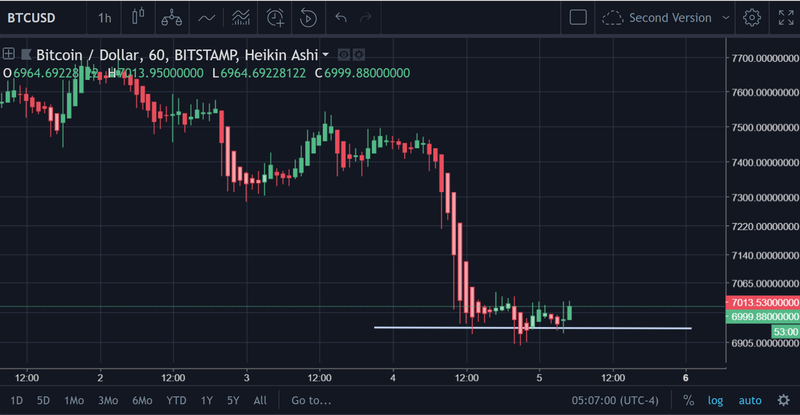 As you can see the price drop is looking a bit over-extended on the 4H chart now (finally). It’s hanging outside of the bottom of the Bollinger’s Bands, which means that an impending price increase is pretty much fair game from that point. RSI(14) has been shooting down on the daily chart for $BTC #Bitcoin. Typically, there’s some sort of bump in the RSI before it hits the other end of the spectrum (from oversold to overbought and vice versa). 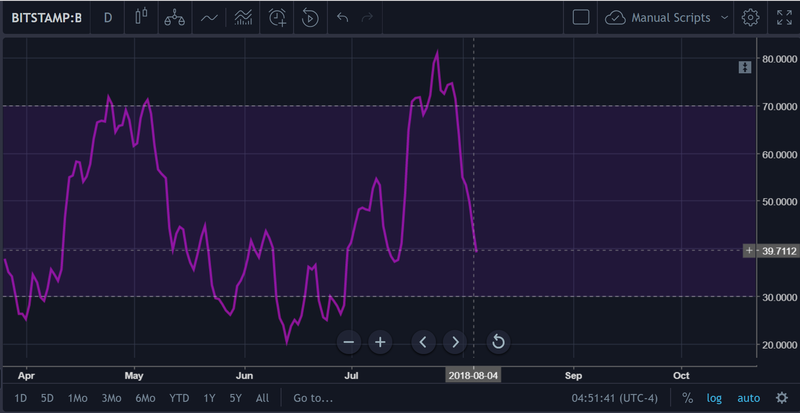 It’s important to understand though that the RSI is not yet oversold at this point, and we are still in a bear market. However, more often than not, the RSI tends to take a break shortly before continuing forward. 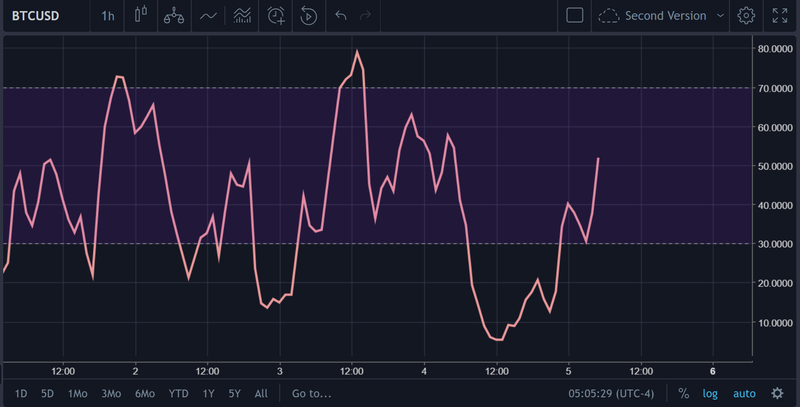 The 12H just touched the oversold range. Even more oversold on the 4H. Let’s check out the price activity over the last 24 hours, because a lot has happened. So, the price has depreciated by 7% over the last 24 hours, which is pretty substantive. 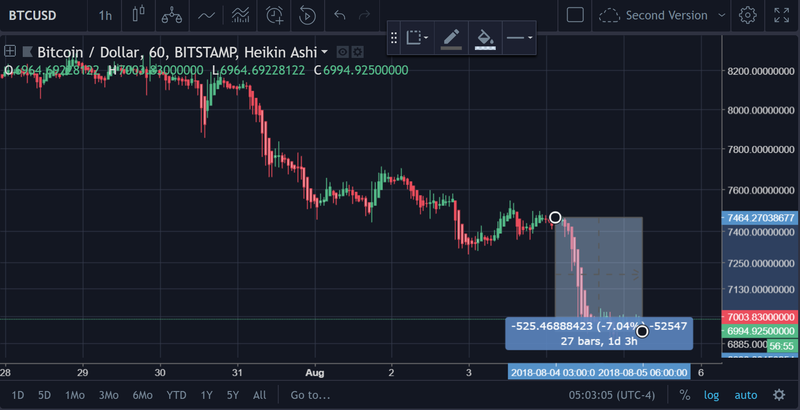 It broke straight through the $7.2k support that we outlined in one of our former price articles and is now just below $7k as it looks to be making that push toward $6.8k as we predicted it would a few days ago. Let’s answer a couple of questions before getting into the other reasons for why there is reason to be somewhat bullish on the price of $BTC at this current moment. Why Did Bitcoin Drop So Much in Price Today, Specifically? So, now that we know why the price depreciated and can attribute it to a mostly event-driven decline, we know that there is a specific reason for the decline (for the most part — or at least the acceleration of said decline). 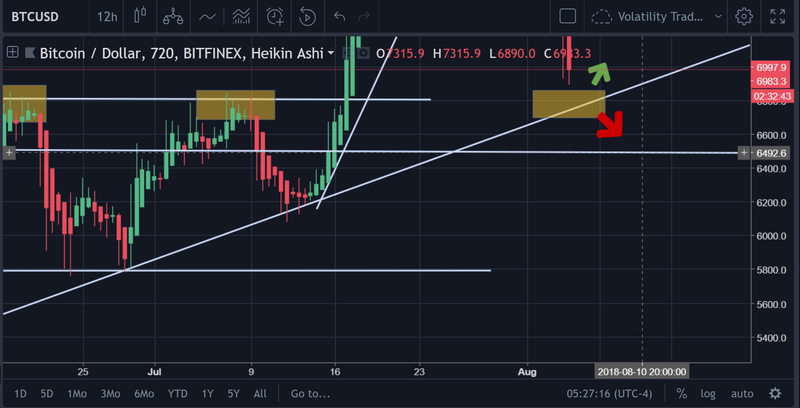 Those yellow rectangles that you see on the chart above represent the $6.8k critical support point that Bitcoin is getting ready to test. 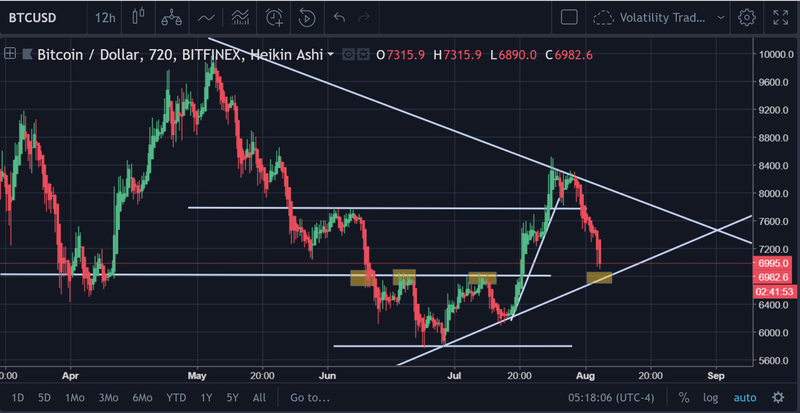 That diagonal line that the price looks destined to coincide with also represents that former uptrend from June 28th to the present moment. Above is a depiction of what the author is proposing the future price action will be. 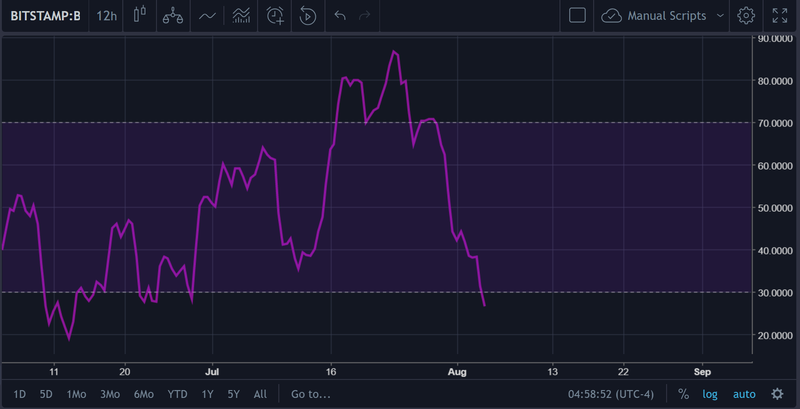 Given the converging support points as well as the oversold RSIs, it seems as though there is a likelihood that there will be temporary period of relief for Bitcoin bulls and a potential bounce from this $6.8k point. However, bulls should not get too enthusiastic, because there is still a substantial distance for Bitcoin to travel. There is a potential upside of 16.26% on this move. 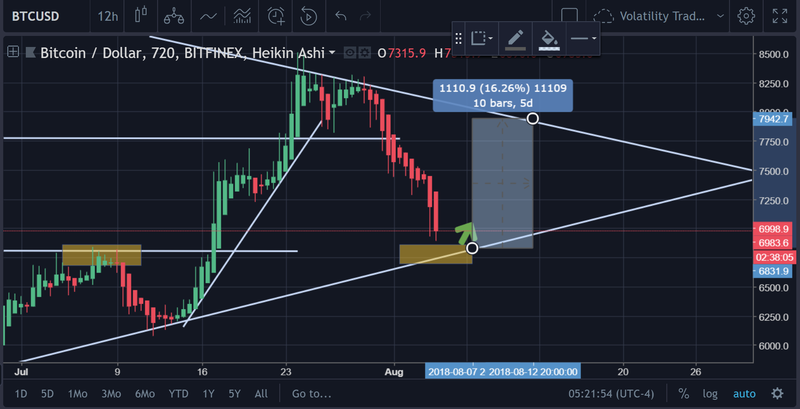 This long-term downtrend resistance stems from the $11.5k peak that occurred in March. However, Bitcoin would need to pass some heavy resistance points before actually being able to reach said “max” R/R. 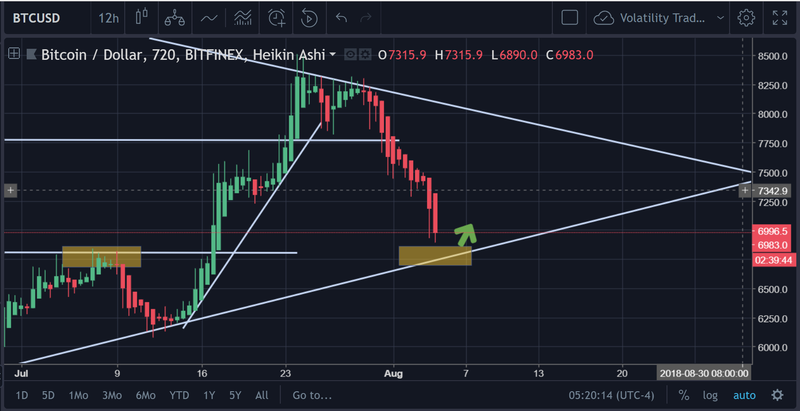 To state that this will not happen, is to state that the price would drop below that critical $6.8k support point. That mean that the price would ultimately end up at $6.5k. This was a very carefully crafted price analysis, because this move that was explained in the graphics and words above may be a few days away from manifesting itself and the move itself may take a few additional days/weeks to manifest. In fact, this scenario may not come to fruition until September. 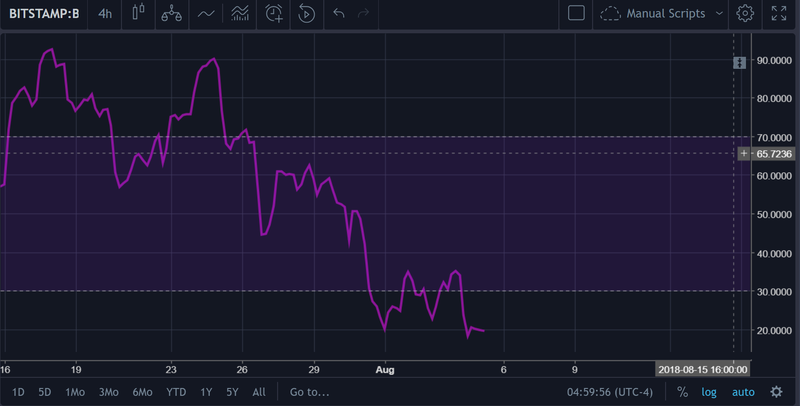 To clarify any confusion, the author still firmly believes that the price of $BTC will continue downward after the bounce occurs. It is important to remember that price movement is never linear.